He can call me a flower if he wants to! Pretty Flower ~ how special to see others with a loving eye, don’t you think ~ to disregard labels and to just see them for who they are? 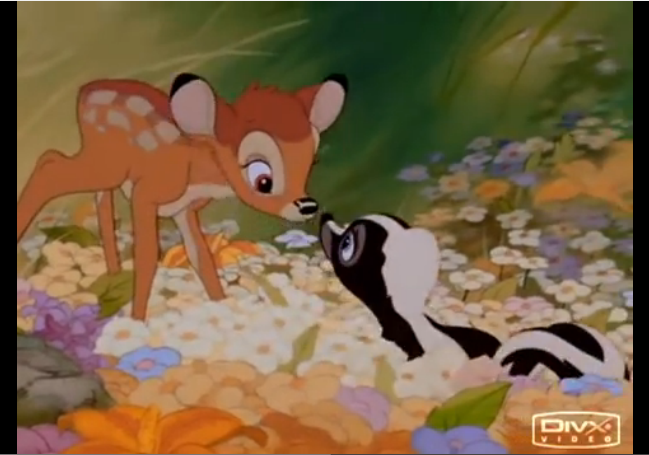 Of course, we know he’s a skunk, but the connotation of a stinky skunk is not relevant when we ‘see’ a pretty flower. Imagine seeing everyone with loving eyes today. It’s the first day of Spring! You can call everyone flower today! Have you seen the SNOW lately? Would you like to know how? Well, look no further my friends, Kathy over at ShareChair will tell you! You can find it here! How to Add Snow to your WordPress Blog. And of course, I have to add a bit of Misifusa to the post…. so please join Dean Martin, Bambi, Thumper and some SNOW!